* Rotate 360 degrees. Smooth & Silent & Sturdy. * Plate Size: 50mm, 1.96" X 50mm, 1.96"
* Hole center to hole center:33mm, 1.29"
* Wheel Dia. : 50mm , 2"
Capacity: 65lbs each -Total 780lbs. Plate Size: 50mm, 1.96" X 50mm, 1.96"
Hole center to hole center:33mm, 1.29". Mounting hole dimensions:6mm X 11.7mm. Wheel Dia. : 50mm , 2". Wheel Width:19mm 0.7". Wheel Material: Polyurethane. Overall Height:70mm, 2.75". 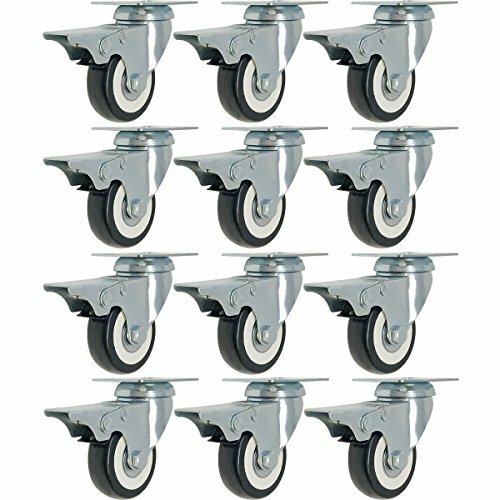 DICASAL 3 inch Swivel Casters with Brakes, Heavy Duty Plate Casters No-Marking Quiet Red PU Castor Load Upto 1200 lbs Pack of 4.